Lunch Part II and Please Take My Poll! First of all, I’ve changed up the look of Just the Assistant a bit. You like? You don’t like? I was fond of the old picture because I was having a good hair day in it, but our team has changed so much since then (we’ve added folks!) that it was outdated. Please send thoughts on this new layout. Plus, I’ve added some categories to the side over there. I see no point in them because my plan is for you all to read every single post I write and have no need for categorization, but I heard they’re good for blogs. I told you earlier this week that last week my fine Bosses James Beaver and Chad Helmcamp brought in lunch for Envoy’s corporate office. And I reminded you that we are just a branch of Envoy (the smartest branch and the one you should use if you plan on securing a mortgage) but we would be quite worthless if it weren’t for all the hard-working peeps at the corporate office. Well, I suppose I could still do my job, because all I do is read Glamour Magazine at the office and make fun of the Bosses on this blog, so I don’t need much support for these efforts. But for James and Chad and all the rest of the team, corporate plays a huge part in their day-to-day operations. And for that, the corporate office deserved some pasta. Our team entered the break room/kitchen area of the corporate office as hoards of Corporatites (that’s what we’ll call them) loaded their plates and dressed their salads. While they did that, James and I stood by all smiley and glowing, saying, “No, thank YOU” whenever anyone would thank us for the lunch. 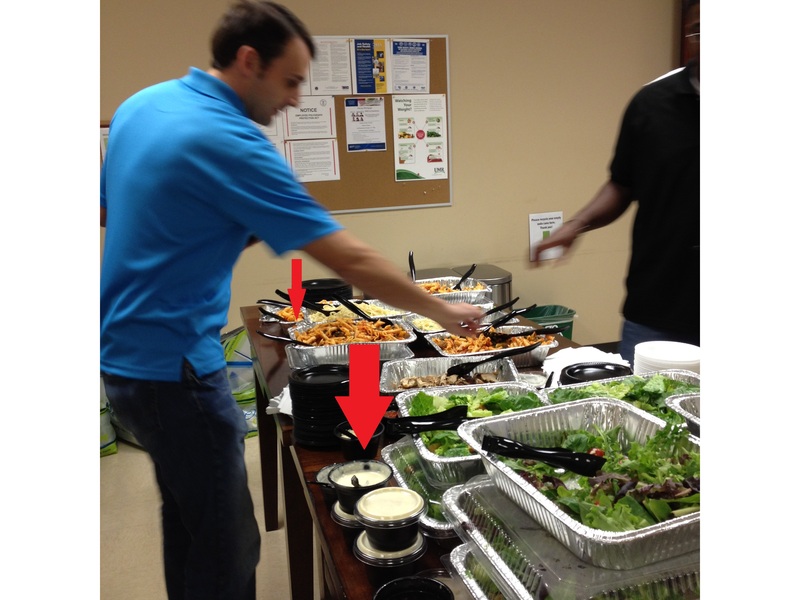 Please note in the picture below that there is plenty of salad dressing for everyone. I swear there was enough. About fifty people when through the line like this, with James and I hamming it up with every iced tea pour. And then, another fifty people came through the line. For this second group of fifty, we gushed a bit less, since there was only one type of pasta left and two trays of salad. We sort of half smiled and nodded at folks and made light jokes about how the pickin’s were slim. Then another ten folks showed up. Okay, now I’m uncomfortable, people. I saw one guy scraping salad dressing with a spoon out of the last container. Then someone made a joke about how he was eating a low-cal diet, but it wasn’t one of those ironic jokes you make because you’re actually eating a whole pizza in one sitting. No, it was because there weren’t enough calories left on the table to fill everyone up. Thanks for all you do, Corporatites! Enjoy these iceberg lettuce leaves, one crouton and a Sweet’n Low packet as a token of our gratitude! James knows what’s up. That ole Boss gave me a prompt nod and wink, and we tiptoed out of there quick-like, after making a mental note to order twice as much salad dressing next time. Envoy isn’t the first mortgage company for whom I’ve worked. But it is the only one for whom I’ve worked with a corporate office that deserved full plates of pasta at lunch. Seriously, I worked for one place where the “corporate” folks still kept all their records by pencil. I’m not making that up. And it wasn’t in like 1985 or anything. I’m talking Facebook had already come out. Okay, I’m sure they were lovely people, but Envoy’s Corporatites are lovely AND up to date on the Internet and such. So my dear Corporatites, I’m sorry. You all deserve so much more. Before I go, next Tuesday I have a meeting with the ole Bosses to discuss the future of this blog. For the record, I’d like everyone to know that if my Bosses plan to take me down, I still have their credit card numbers and will not hesitate to take all my readers on a shopping spree to make amends for not having anything else funny to read on the Internet. But in the event that they aren’t taking me down, are there any changes you’d like to see?